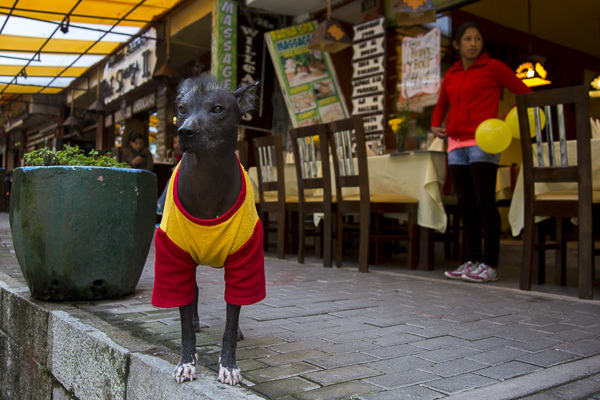 A Peruvian hairless dog stops to observe a train arriving in Agua Calientes, a town at the base of Machu Pichu. 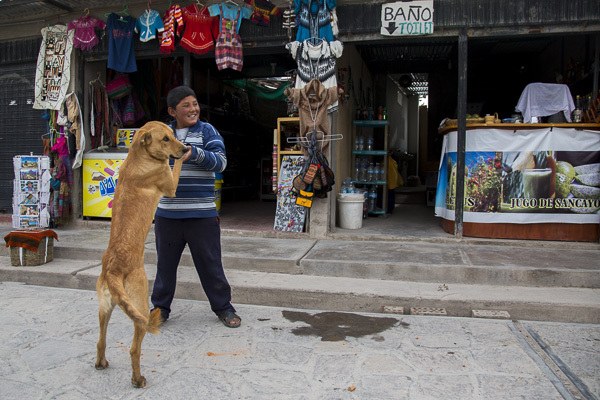 I saw many of these ancient Peruvian dogs walking around in Agua Calientes with specially-made t-shirts. Temperatures in this area are cool in the mornings and evenings. 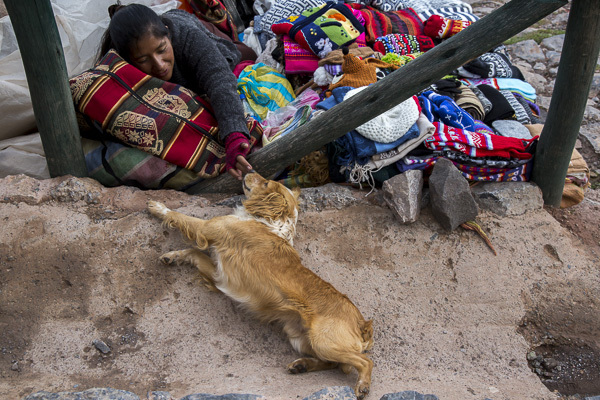 This was just one of many moments in my travels through Peru in which I noticed how much Peruvians embrace their canine residents. As a dog-lover, I always notice dogs and their general well-being when I travel. In many countries, I’ve learned that dogs are seen less as family members than as security guards. Frequently, they’re kept on short chains or slinking around the shadows of the family’s back yard, nervous and ready to snap at the smallest infraction. Alternatively, they are street dogs riddled with ticks or infections, mangy or so thin one can count each rib from a distance. Often, in these same countries, dogs are perceived as dirty (which they usually are because of lack of care) and people balk at the idea of petting a dog or taking him into one’s home. I know that poverty plays a significant role in how cultures treat their dogs. When there isn’t enough food for humans, it’s understandable that dogs too will go hungry. So happily, one of the first things I noticed in Peru was that dogs are ever-present, well-fed and Peruvians seem to love them! 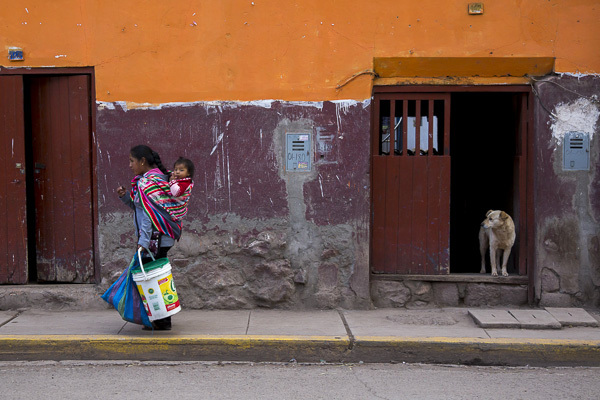 Every corner I turned–whether on the streets of Lima or the tiny towns of the Sacred Valley or Colca Canyon–I joyfully witnessed a new vignette of canine bliss. I saw dogs being scratched, cuddled, played with, fed with market scraps, or simply allowed to sleep peacefully, curled up close to human companions. While I noticed few collars and rarely a leash on these Peruvian dogs and they seemed to wander the streets peacefully with a traffic savviness my own pooches certainly will never attain, they did not seem to be strays or gather in packs as street dogs sometimes do. They simply looked like there were going about their days, exploring the usual nooks and crannies, visiting their doggy or human friends and then wandering home at the end of the day for a good meal. Who knows why dogs are so integrated into Peruvian culture in a way they aren’t in so many other countries. I know that the Peruvian hairless dog breed dates back to pre-Incan times but whatever the reason, I was so inspired by this canine-loving culture that I thought I’d share some of my favorite Peruvian doggy moments. 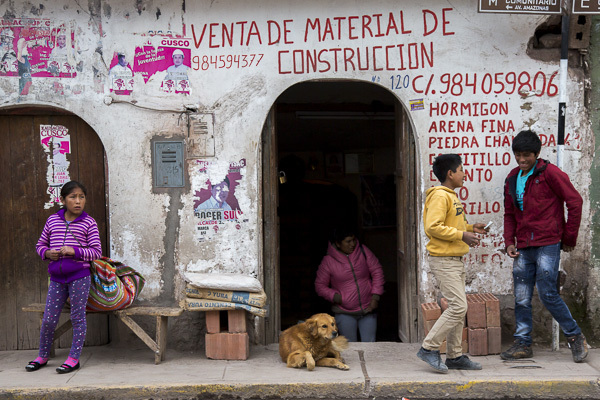 A dog watches the goings-on from the doorway of his family's home in the small town of Pisac, Peru. I watched this young boy play with his dog for a long time outside his family's store in Maca. I was struck by the affection and trust between them. 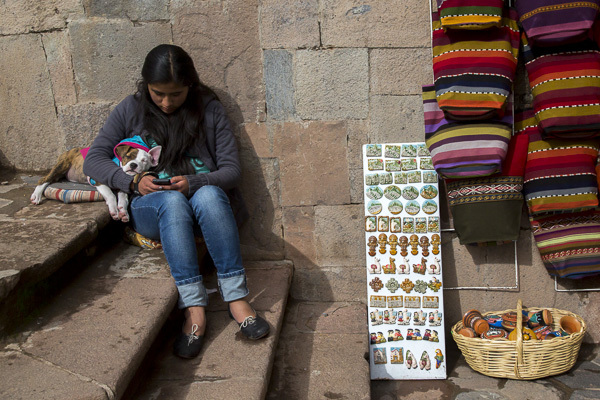 A young woman texts on her phone while waiting for customers at a tourist shop in Cuzco. I was touched by the little bed her dog slept on and the way in which she draped her arm around him as he slept. 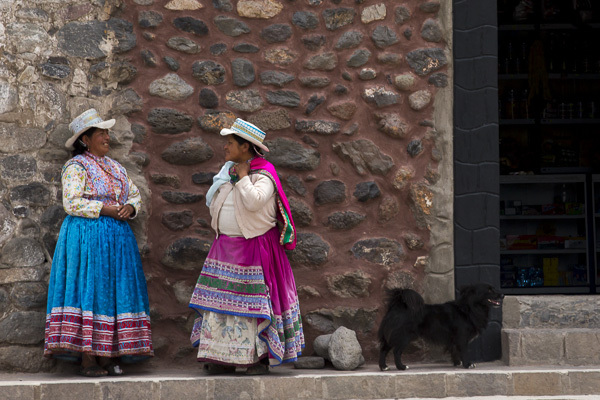 Two traditionally-dressed Peruvian women chat on the streets of Chivay while a dog waits close by. 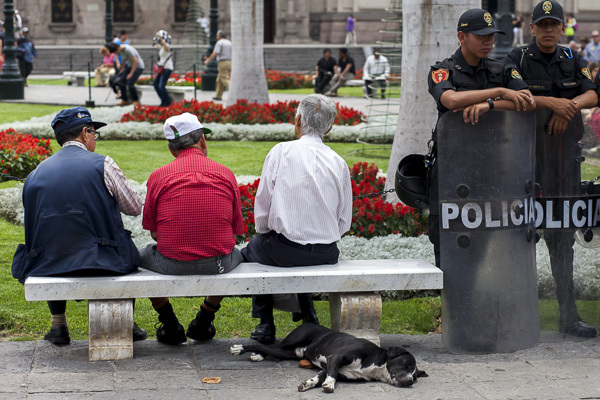 A dog snoozes peacefully in Lima's Plaza de Armas close to the Government Palace, seemingly unconcerned about the presence of riot police beside him. 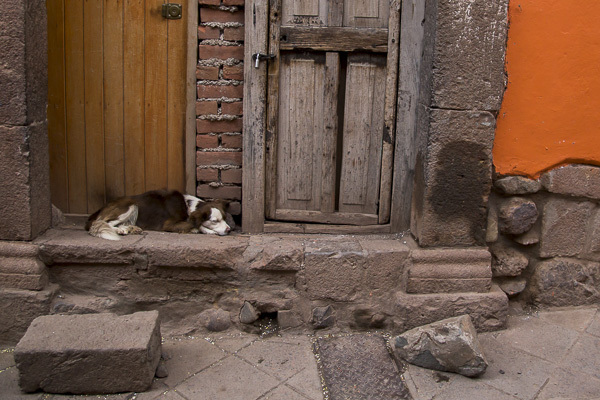 A dog sleeps on the step of his family's home in Pisac. I saw dogs sleeping in so many spots like this. 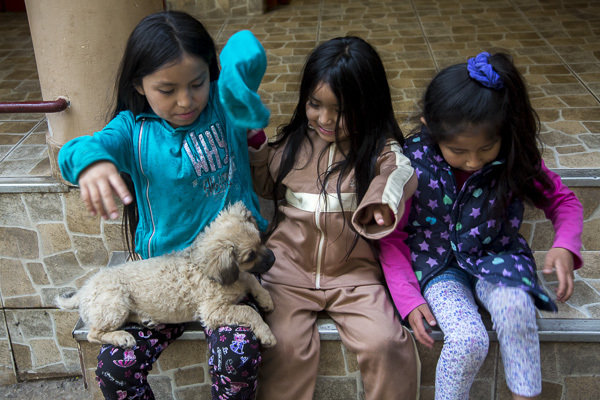 Three young girls play with a puppy on the steps outside their family's restaurant in Agua Calientes--the town at the base of Machu Pichu. 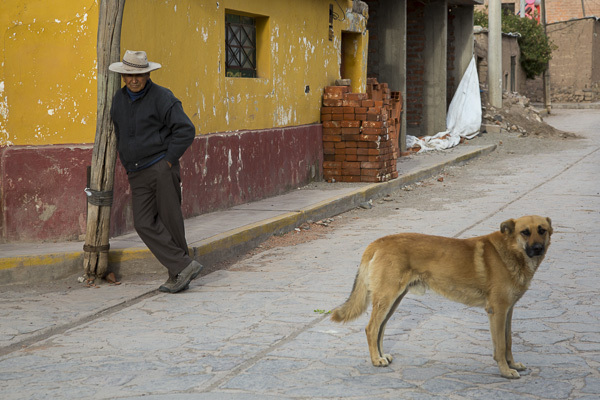 A dog seemingly enjoys being in the midst of the action on a street corner in Pisac. While he was clearly blocking the sidewalk, I didn't see anyone chase him away. 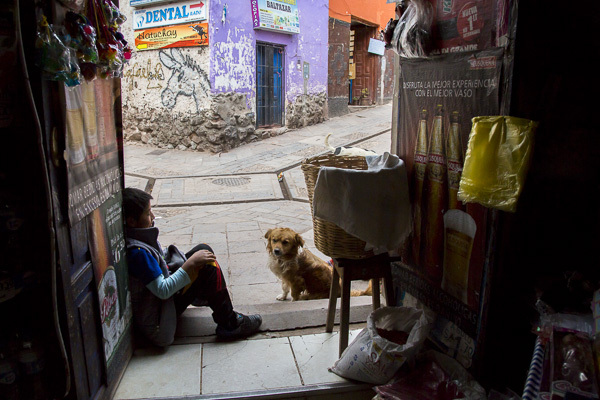 A boy and his dog keep each other company in the entranceway of the family's convenience store in Pisac. 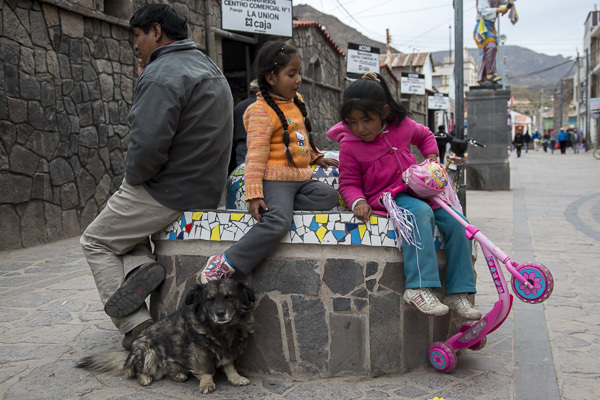 A little girl nonchalantly rests her foot on a dog's head as she hangs out with her friend in Chivay. I was surprised by how tolerant the dog was of the little girl's foot. 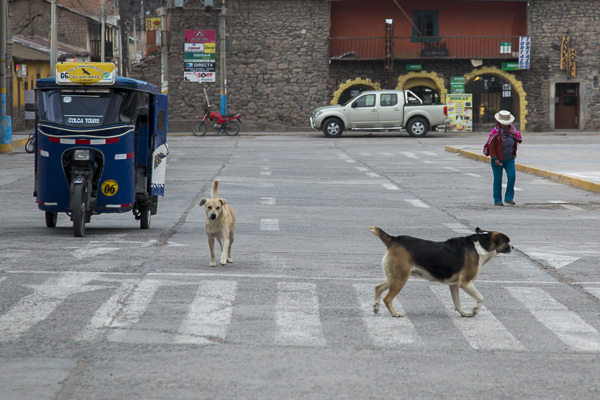 A dog crosses the street at the cross walk while another walks down the center of the street in the tiny town of Chivay. A woman affectionately touches the nose of her dog while waiting for tourists to purchase her wares at the Incan historical site of Q'enqo just outside of Cuzco. A classic Peruvian scene in the Colca Canyon town of Chivay. If you or someone you know would like to receive new blog posts directly through your email, please sign up in the right hand column or email me at julia@juliacumesphoto.com. Thank you! ps. comments are closed due to an overabundance of spam but please feel free to respond to this blog post directly if you have any questions or comments.